Improving filly Lyre has earned herself a start in the Group 1 $1.5m Ladbrokes Blue Diamond Stakes (1200m) after scoring an upset win in the Group 2 $200,000 Ladbrokes Blue Diamond Prelude (1100m) for the fillies at Caulfield today. Lyre, above, scores an upset win in the Blue Diamond Prelude for the fillies at Caulfield. Photo by Ultimate Racing Photos. The Anthony Freedman trained Lyre will line up at Caulfield in a fortnight in the Group 1 for the two year olds against her unbeaten stablemate I Am Immortal who won the Prelude for the colts and geldings forty minutes earlier. Winning jockey Damian Lane settled Lyre in the second half of the field after coming out of a wide barrier and the Lonhro filly finished strongly over the concluding stages to get the judge’s decision at the long odds of $26. Runner up Vinicunca, also at double figure odds at $20, set the pace and fought on well to finish second while the James Cummings trained Athiri ($5) wasn’t far away in third spot. The $2.10 favourite Catch Me raced on the pace but faded quickly in the straight to finish near the tail of the field, indicating that something must have gone amiss with the Peter and Paul Snowden trained filly. Stable representative Sam Freedman said that Lyre has improved considerably since her win in a Sale Maiden on January 20 and is looking forward to seeing her running in the Blue Diamond Stakes in a fortnight. “She is a filly that is improving all of the time. Her win last time, she just didn’t know how to put them away and she seemed to have learned a lot from that,” Sam Freedman said. Lyre has firmed dramatically in the Blue Diamond Stakes betting at Ladbrokes.com.au to be marked at $9 after $26 was available before her win in the Blue Diamond Prelude for the fillies. 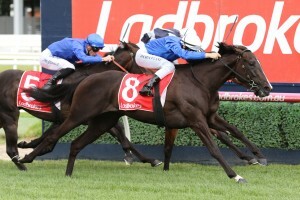 The post Lyre earns a start in 2019 Ladbrokes Blue Diamond Stakes after upset win in fillies Prelude appeared first on HorseRacing.com.au.